Whether installing a new irrigation system, retrofitting your current system for increased efficiency, or making repairs, always hire a licensed irrigation professional. An irrigation professional licensed by the Texas Commission on Environmental Quality has an increased level of commitment and is in compliance with the Texas Administrative Code. Title 30. Part 1. Chapter 344. Subchapter C.
What are the advantages to hiring a licensed irrigation professional? TCEQ is the licensing entity for licensed irrigators in Texas. Before receiving a license, candidates must take and pass a comprehensive exam after undergoing hours of in depth classroom instruction. Once licensed, Texas irrigators spend a minimum of 24 hours over their three year licensing period taking Continuing Education Units (CEUs) to maintain their license. CEU subject matter is supervised by the TCEQ and is undergirded in water conservation and efficient irrigation methods. Every licensed irrigator undergoes an extensive background check through the TCEQ by completing a Criminal History Notification. Evaluation on license eligibility is made by the TCEQ according to Occupations Code. Title 2. Chapter 53. Subchapter A – D.
Most licensed irrigation professionals carry appropriate insurance specifically written to protect you and your property. Workman’s compensation and general liability insurance are the most common. Many licensed irrigation professionals are members of a professional trade association where they are kept up to date with local and state rules and regulations and receive additional product trends and training. Licensed irrigators have been trained to install, maintain, and service an irrigation system to insure that safe drinking water does not become contaminated by the incorrect application of backflow devices. 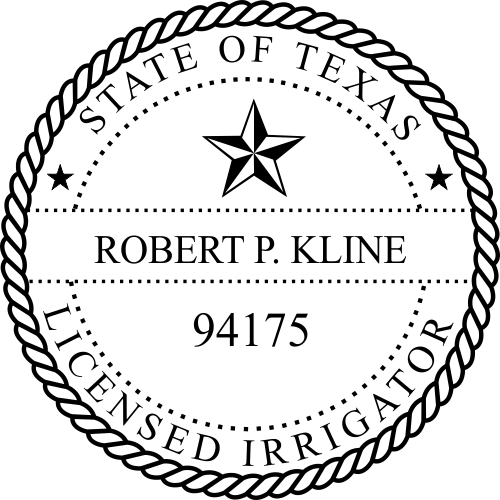 How do I know if an irrigator is licensed by the state of Texas? The TCEQ requires that all advertisements, both written and electronic, distributed by a license irrigator must clearly display his/her license number in the format of “LI” and seven numerical digits. This includes both written and electronic advertisements. If an individual is working under a licensed irrigator, the licensed irrigator’s name and number must be present. Any vehicle utilized in the performance of installing, maintenance, alteration, repair or service of an irrigation system should display the irrigator’s license number as well. How can I find a licensed irrigator? Licensed irrigators in the state of Texas can be searched by zip code, city, or county on the TCEQ web site under “Find a Licensed Irrigator in Your Area“.